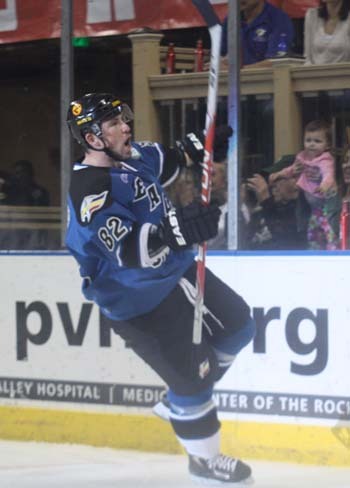 LOVELAND, Colo. – The Colorado Eagles defeated the Missouri Mavericks, 3-2, in overtime at the Budweiser Events Center one night after the Mavs topped the Eagles in overtime in their own home. The game was the second of three in as many days between the two Turner Conference clubs. The first period was a physical affair with plenty of big hits, outdone only by the several big saves at each end of the ice. Colorado out-shot Missouri 15-4, but each of the Mavs’ chances were quality, as were several of the Eagles’. The period’s lone goal came 3:44 in when Joe Grimaldi scored with a blast from the right point as the only power play of the period was about to expire. 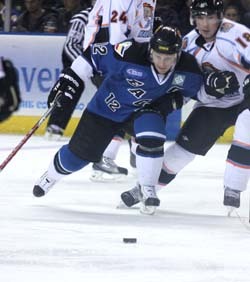 The second period saw similar action, with each team finding the back of the net once. Colorado nearly went on top 2-0, 1:30 into the second period, but Nick Sirota sticked a fluttering puck out of mid-air as it was heading into the net behind Nolan. Three minutes later, Missouri tied the game at 1 with a power-play goal of their own when Mike Berry deflected a point shot from the doorstep. But just nine seconds later, Dan Sullivan put the Eagles back on top with a shot from the right circle. On the play, a pair of touch passes by Aaron Schneekloth and Riley Nelson sprung Sullivan into the offensive zone where he used a Missouri defenseman to screen his shot that beat the Mavs’ netminder. Missouri came hard in the third, but couldn’t solve Penner until the final seconds with the help of an extra attacker. At 19:51, Sirota took a shot from the right wing that made its way through a maze of bodies and was tipped by Shawn Fensel in front of the net. That goal sent the game into overtime for the second night in a row. Just like Friday night, the game would be decided by a power-play goal in the extra session. Thirty-eight seconds in, Blake Forsyth was called for a pair of minor penalties — canceling out a Steve Haddon penalty — that put the Eagles on the power play. It took just 12 seconds for Riley Nelson to end the game after that as he burst down the left wing, cut toward the slot and roofed a backhand shot past Nolan. The two teams will meet for the third night in a row on Sunday at the Budweiser Events Center.